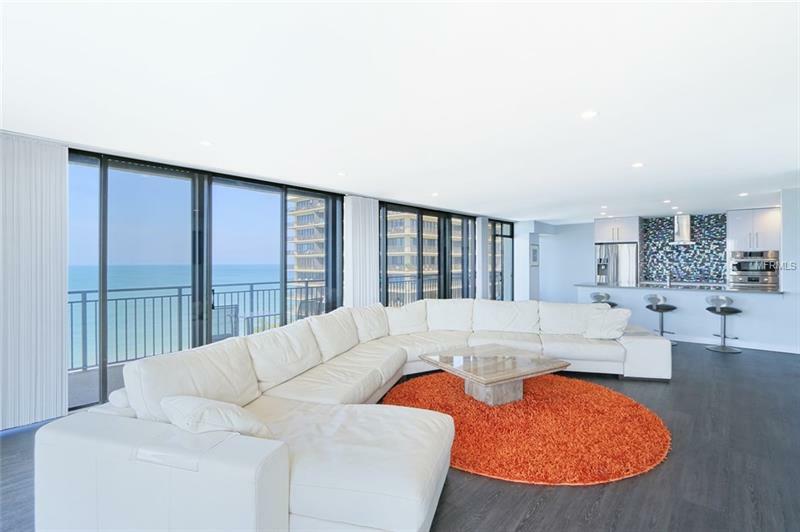 Luxury Mansions by the Sea Condo for Sale! Year-round 90-degree southwest Gulf-views from the 8th floor. Whatâs new? Almost everything. Major renovation was completed in 2018. Stepping into this Mansion you will instantly be impressed with a modern-style, massive kitchen island as the center piece within a redesigned open concept kitchen and large great room. The wood-look floors and smooth, flat surface walls and ceilings feel like key elements in the dÃ©cor, setting you up for âmagazine-lifestyleâ living at one of the most attractive condo buildings in all of Tampa Bay. 80 feet of balcony surround the great room and both bedrooms. Electric storm shutters for safety and sun-protection are in perfect working condition. Common areas include: A large heated pool, tennis courts, fitness center, two saunas, game room, library, community room, shuffle board, outdoor grills, pavilion, trailer/RV parking. Sunset Beach on Treasure Island is an amazing beach-neighborhood easy to fall in love with and increasingly popular worldwide. Call today for a showing.